While this is a safe and highly effective strategy, selling covered calls does have a drawback – of a sort. Essentially, what you do is take the money you received for selling the stock when the covered calls you sold were exercised and use it as collateral (or "margin") for the sale of an appropriate number of out-of-the-money put options on the same stock. For example, assume you had 500 shares of XYZ stock you had purchased at $28 a share ($14,000) in order to collect the 21-cent quarterly dividend ($105, or $420 per year). Let's also assume that, in an effort to boost your yield, you'd also sold five "covered" XYZ call options with a strike price of $30 and three months remaining till expiration, bringing in an added 90 cents per share ($450). That sounds great – but if the market rallies, taking XYZ to $31 by the expiration date, you would have to sell your 500 shares of XYZ at the $30 strike price. Doing so, you would score a $2-per-share profit ($1,000), but also forfeit the next quarterly dividend – as well as the opportunity to sell more covered calls. In other words, the upward price movement would cause you to lose your regular cash flow. So, what can you do to keep this income stream alive? Quite simply, you leave the $15,000 you received for selling the XYZ stock in your account and use it as collateral to sell five out-of-the-money cash-secured puts with three months of life remaining. With XYZ stock at $31 a share, the optimum choice would be the $30 strike price puts, which would likely be priced around $1.20 per share ($120 per option contract), bringing in $600 in quarterly cash flow (minus a modest commission). The end result? You get a quarterly return of 4% ($600/$15,000 = 4.0%) and an effective annual yield of 16% on XYZ – better than you were earning before – even though you no longer own XYZ stock. To give you a better idea of how this combination might work out over time, the accompanying table shows a 14-month scenario utilizing 300 shares of pharmaceutical giant Abbott Laboratories (NYSE: ABT), recent price $55.00. The scenario assumes ABT stock, which pays a quarterly dividend of 48 cents a share (yielding 3.5% annually), was purchased at $52.25 in June of 2011 when the market bounced off spring lows, and out-of-the-money calls were sold against it to enhance the cash flow and yield. Selling the August $55 and then the November $52.50 covered calls brought in a total of $705, which reduced the net cost of the position to $14,970, not including the two quarterly dividends of $144 ($0.48 x 300 = $144) received in July and October. However, ABT stock rose in November, climbing to $53.52 by the expiration date, and the stock had to be sold at the call's strike price of $52.50 for a modest gain of 25 cents a share. Had the investor simply stopped there, his total profit on the trade would have been $780, plus the $288 in dividends – a return of 6.81% on the original $15,675 investment. The investor chose to use the money as collateral to write (or sell) cash-secured puts on ABT. Selling first the February $50 puts and the May $52.50 puts, both of which expired worthless, and then the August $52.50 puts, the investor brought in $855 – a nine-month return on the $15,750 posted as collateral of 5.42%, or 7.23% annualized. Then, when ABT's stock price pulled back to $51.90 on the August expiration date, the puts were exercised and the investor had to buy the 300 shares at $52.50 – the exact same price he sold them for nine months earlier. The difference this time is that the income from first selling covered calls, then cash-secured puts reduced his net cost for the 300 shares to just $14,115, giving him a cumulative gain of $1,635 on the full series of trades, plus the $288 in dividends. And, best of all, he's now positioned to repeat the entire process – once again writing covered calls and collecting dividends on his ABT shares. Selling cash-secured puts can also be used as a means of generating income while you wait to purchase the shares of a stock you'd like to own at a "bargain price" relative to where it's trading now – a favorite trading tactic of Money Morning Chief Investment Strategist Keith Fitz-Gerald. For example, if you'd like to add Abbott Laboratories to your portfolio but think it would be fairly valued at $50 a share rather than its current price of $55, simply use the money you'd spend on the stock to secure the sale of ABT puts with a $50 strike price. 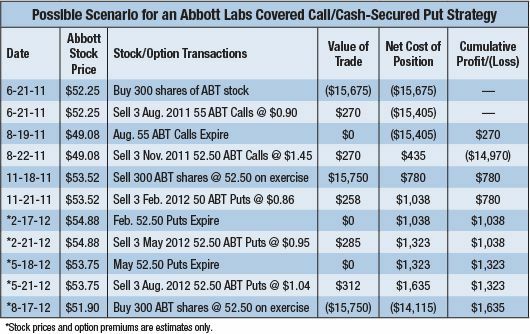 Then, keep repeating the process – either quarterly or using the monthly options – and collecting the put premiums until Abbott Labs pulls back below $50 a share. At that point, the puts you sold will be exercised, and you'll get to buy the stock at the price you wanted. In other words, you get both cash flow – and a bargain!